This boy is ravenous. And the only thing he eats can only be provided by me. I am fairly sprinting to keep up. He is nothing at all like his big sister, who had, what I thought, was a fair appetite. There was always more than enough for her. Now I sit here, shamefully bedraggled, bleary eyed from lack of sleep, but still staunchly determined. Despite the weariness, I am happily proud of little H’s voracious appetite. He is mine after all. My heart swells along with his impossibly soft, fuzzy, infant cheeks. When the bleary bedraggled-ness starts to get the better of me though, I take a step back, commandeer a few moments for myself, and recharge. That could be by way of a short nap (admittedly those are few and far between), a spot of writing (as I am doing now), or some time by the stove (yes, cooking is therapeutic for me and can recharge as much as a nap can in my book). Plotting the new wardrobe I’m going to purchase (soon!) is also wonderfully revivifying. But, back to the stove, and cooking things on it. My hungry little H is not the only one who needs to be fed in this house. There is also big and little C, and myself. Little C in particular, I feel, is in need of special pampering, with so many changes having recently transpired in our home. She has also started another school year and, for the first time, eats her lunch at school. For some reason we are still trying to figure out, despite eating well at home, she doesn’t like to eat her lunch at school. Pasta is one of her favorite foods, with tomato-based ones ranking the highest. I wanted to pack something familiar and well loved in the hopes that an edible “comfort zone” would encourage her to finish her lunch while away from home. And since I had this recipe bookmarked for quite some time now, it was the perfect time to finally try it. It is also one of the easiest and simplest pasta sauces to make…especially important to any and all bleary-eyed and bedraggled new mums out there. 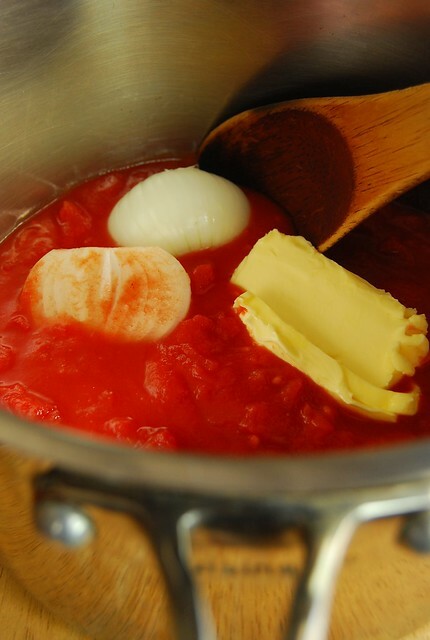 – Place the tomatoes (with all their juices), butter, and onion in a heavy-bottomed saucepan over medium heat. – Bring this to a simmer then lower the heat and simmer gently, uncovered, for 45 minutes, or until droplets of fat float free from the tomatoes. Stir occasionally, mashing tomato chunks with the back of a wooden spoon when you come upon them. Salt to taste. – Remove and discard the onion. That’s it! Serve with your favorite pasta noodle and, if you’d like, some freshly grated Parmesan. Although just plain with the noodles is already wonderful. The sauce is lovely. 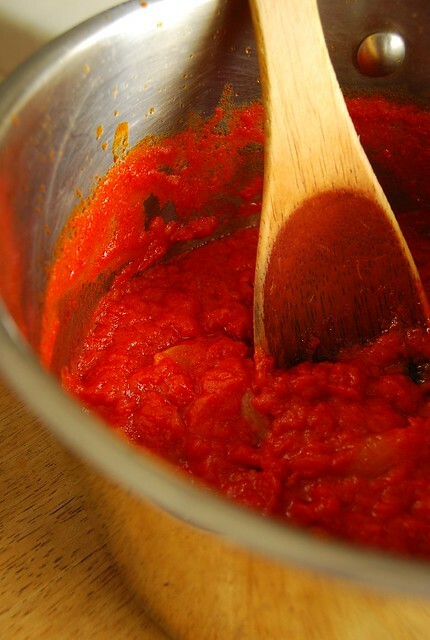 It is sweet and velvety and rich, and really a perfect basic tomato sauce to have in one’s repertoire. You can also use it as a jumping off point for other variation but please don’t forgo trying it plain, just generously spooned over some hot noodles, eaten from a bowl. Anyone with very little time on their hands and a hankering for good, honest deliciousness will appreciate this sauce. It may just be the easiest thing I have ever made. The original recipe uses canned whole tomatoes but I used canned chopped tomatoes here because that it what I had on hand. It does go without saying that the better quality of canned tomatoes you use, the better your sauce will be. Oh, and I didn’t discard the onion. I placed it in an omelet for breakfast the next day…waste not, want not! And yes, my little girl was very happy with it and it marked the first time she finished her lunch at school! How excited she was to tell me and show me her empty lunch box. It’s moments like this that make any lack of sleep, or less than glamorous appearance, so absolutely worth it. I have been DYING to try this recipe, ever since I've read about it on Smitten Kitchen, via one of my favorite style blogs. Such is the power of this sauce that it even makes it way to a style blog. And I have to add your post to the list of reasons to make it. I saw this recipe on Annie's Eats a couple years ago, and it has been my go-to sauce ever since! I love the flavor! Last year, we learned my husband has a dairy allergy, so I substitute with olive oil, and it is still delicious. When I add ground beef to it, I do add a little sugar and plenty of basil, either fresh or dried. I have tried a couple times to go back to store-bought sauce, and it is just NOT the same. I'm sticking with this great recipe! Thanks for sharing! Awwww. It must feel so great to finally get what she wants! I have nevertheless made a sauce without garlic. I should try this one without. 🙂 Have a great day! I meant never made a sauce without garlic.ooops! This recipe looks great. Can't wait to try it. Joey….that is my go-to tomato sauce for years now! A regular at our house is penne/smoked sausage/peppers/leftover roast chicken pasta with Mrs. Hazan's tomato sauce. Another is SINIGANG WITH ThAi twist…haven't had the opportunity to taste Mamou's SINIGANG but I add that tomato sauce to it when I boil the country style ribs with Lime leaves added t it and a bit if Tom Yum paste…with eggplants, labanos, okra, and sitao….comfort food at our house at its best! the rest, I cut them to chunks and return them to the pot….added to the sausage-penne pasta or to the SINIGANG….I do urge you to try the SINIGANG! Hope you have a great weekend Joey! Hi Rosa! It is! And with such minimal ingredients! Hi Kat! Try it! So unbelievably easy to do and so yummy 🙂 Enjoy! Hi Shalum! I think the Amateur Gourmet tried it with garlic 🙂 I'm sure it would also be delicious! Hi John! Hope you enjoy it! Hi Betty q! Thanks for sharing your variations! They sound fantastic!! Especially that sinigang…must try!! This simple recipe is a gem. =) Love your blog! I made this yesterday and my boyfriend, who usually turns his nose up at anything that has veggies in it and always makes a face at dishes that has tomatoes, absolutely loved it. He wants me to make more next weekend. Thanks for this! Thanks for sharing! I will try this asap. I have a can of tomatoes sitting idle. How long can i keep the sauce in the fridge if i am not going to use it all up at one time?